The long-promised but rarely seen Hisense Sero 8 Pro Android tablet launched in Italy this week, its second international launch following a UK launch early this year. This 8" tablet runs Android 4.4.4 KitKat on a quad-core Rockchip RK3288 CPU (the same CPU used in Hisense's new Chromebook) with 2GB RAM and a Mali-400 GPU. The tablet packs in Wifi, Bluetooth, 16GB internal storage, and a pair of cameras (5MP and 2MP). Reportedly measuring a mere 6.4mm thick, the Sero 8 Pro has a 4.5Ah battery which is specced as offering up to 10 hours of video playback. Its 8" display has a screen resolution of 2048 × 1536. According to Notebook Italia, the Sero 8 Pro is now available in Italy with a retail price of 199 euros. 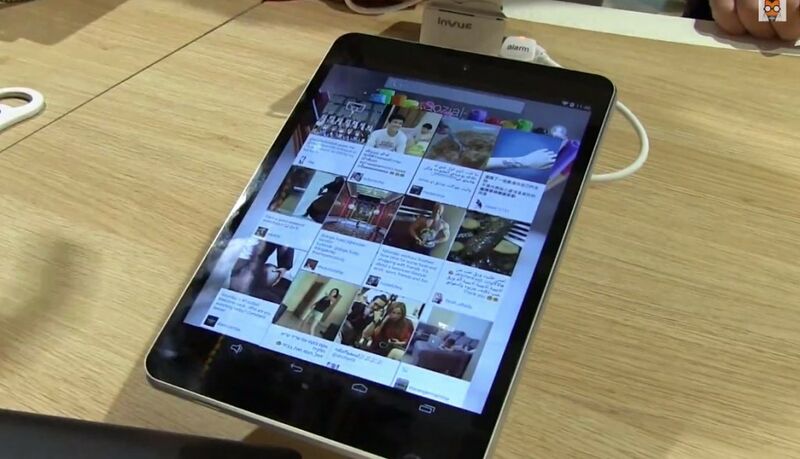 In 2013 Hisense was the budget tablet maker who could do no wrong. The Sero 7 Pro set the standard for the budget tablet market that year, but Hisense never followed up their success with a better tablet in 2014. They did release the Hisense Sero 8, but while it was an okay tablet it wasn't an amazing wunder-tablet like the Sero 7 Pro. And now it's clear that the Sero 8 Pro won't be a breakout success on the scale of the Sero 7 Pro either. With a price tag of 199 euros it's not a budget tablet anymore, and the early user reviews coming out of China are disappointing. Mike Cane has been following Chinese tablet news with a hawk's eye, and last week he found a user review (in Chinese) which criticized the tablet's build quality, cameras, and battery life. Mike also noted that the benchmark test results should be higher than what the Chinese reviewer report, and he concluded that Hisense had not optimized the software yet. Given the price tag and early review, I don't know that I'll buy this tablet - not even to post a review on the blog. I really don't think it's worth getting. 199 euros in Italy is not terrible given the recent currency fluctuations and Italy’s 22% VAT. If you deduct VAT , it’s some 163 euros and that’s 175$. Ofc the thing is somewhat outdated now. I hope we see tabs with Mediatek MT8173 soon. The dual A72 would offer great perf and the dual A53 are good enough to offer plenty of power when needed. Given that it kinda replaces the dual A15+dual A7 that Amazon uses in the cheaper models,we might see it in this year’s budget models and that would be outstanding given the perf. That price would have been fine around this time last year, but now it’s too high. The specs don’t support the price. At most, this should cost $149 euros, and a price of $129 euros would be even more reasonable. You are forgetting the high res screen, you got very few options in the West for that at sane prices. The SoC is not bad compared to most available, it also has 2GB RAM so all in all it might be difficult to find the specs for the price in Europe. The ipad mini is Italy is 399 euros , the gen 2 mini is 299, a Xiaomi mipad in China is 210$ (faster SoC , likely better screen), the Shield Tablet is 299 EUR in Italy. 149 euros would result in 131 $ excluding VAT and you would have a very hard time finding that even with 7 inch 1200p screen and quad A7 not A17. Hell, at 175$ ( the price 199 euros translates into without VAT), even on Aliexpress you won’t find better deals. You might also be underestimating the currency fluctuations. 1 year ago an euro was almost 1.4USD while now it’s 1.075. So 1 year ago the 199 euros would have resulted in about 228$ after excluding VAT and converting to USD. Anyway , you should browse EU stores and Aliexpress for better deals and you’ll see the 175$ price is not high. (Pipo P8 or FNF ifive mini4 have similar specs). The price you want is just not doable (except inventory dumping) with a SoC that’s rather big and high res screen. Actually, you’re right. I am forgetting that screen. I was thinking that it was already on $199 8 inch tablets last year, but that was not the case. Those older tablets had the lower resolution screen (8″, 1024 x 768). High res screens in tabs were widespread in China but not so much elsewhere outside the high priced Samsung or Apple. Now they are starting to be more popular outside of China but still not that many models and not so much from established brands. Even 1920×1200 is not in enough cheap tabs and that’s a pity.